There are precious few live recordings of the legendary Everly Brothers, either on official releases, or in the bootleg world. A recording circulates online from Jones Beach in 1984, on the verge of the release of their great comeback album, EB/84. That tape's a little distant-sounding, but it's a great setlist and performance. But this is a recording I found as a CD-R and have never seen elsewhere. I love the Everlys' classic period, of course -- who doesn't? -- but I really like what came after, too, everything from the mid-'60s on. But this is about as "after" as it gets, at least as far as live recordings that I know of go, and they still sound as great as ever. The setlist, of course, is mostly early hits, but at least they throw in "Bowling Green" from what I'll call the early middle period. As far as official live albums, The Everly Brothers Show is a great live album from 1970, featuring a wild 18-minute medley that takes in Chuck Berry, Tim Hardin, "Aquarius" from Hair, and Abbey Road's "The End", plus another Beatles cover in "Hey Jude" -- that one in a medley with "Susie Q"! A really interesting, surprising show. 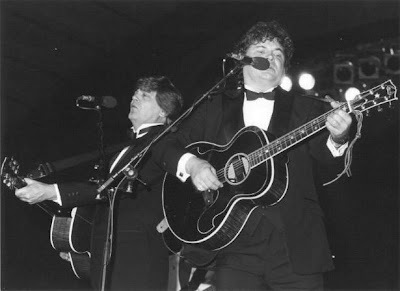 The Everlys adapted better to the post-Beatles era than any other '50s artists, perhaps because of their youth, as well as how indebted the Beatles' and Simon and Garfunkel's harmonies were to Don and Phil's. The other live album in release is their Reunion Concert album from 1983, which comes in so many off-brand incarnations I'm not sure which to recommend. Some have annoying breaks between tracks, fading in and out of applause. Others come in two separate "volumes", and then there are abridged versions too. It's a great performance, though, and worth tracking down if you can find a good release. You'll want to surf on over to Nathan's Rock Moat to find the aforementioned 1984 show. That 1984 show is now here. Meanwhile, enjoy this concert, and rock 'n' roll with The Rare Stuff! Rare as chickens teeth on the moon...Thanks so very much..!! !